Glusterfs is a scalable network filesystem with capabilities of scaling to several petabytes and handling thousands of clients. It's an open source and distributed file system that sets disk storage resources from multiple servers into a single namespace. It's suitable for data-intensive tasks such as cloud storage and data media streaming. In this tutorial, I will show how to set up a high availability storage server with GlusterFS on Ubuntu 18.04 LTS (Bionic Beaver). We will use 3 ubuntu servers, 1 server as a client, and 2 others as a storage. Each storage server will be a mirror of the other, and files will be replicated across both storage servers. The first step we need to do before installing glusterfs on all servers is configuring the hosts' file and add GlusterFS repository to each server. Log in to each server and get the root access with 'sudo su' command, then edit the '/etc/hosts' file. 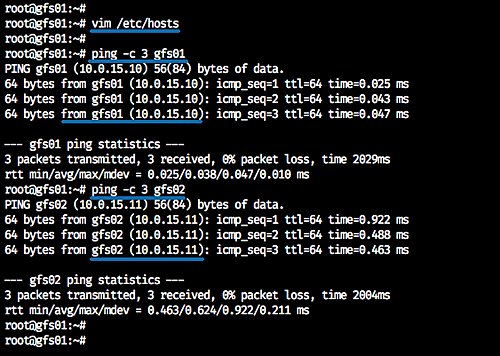 Now ping each server using the hostname as below. Install the software-properties-common package to the system. Add the glusterfs key and repository by running commands below. The command will update all repositories. And we've already added the glusterfs repository to all systems. In this step, we will install the glusterfs server on 'gfs01' and 'gfs02' servers. Install glusterfs-server using the apt command. Now start the glusterd service and enable it to launch everytime at system boot. Glusterfs server is now up and running on the 'gfs01' and 'gfs02' servers. Check the services and the installed software version. Glusterd services are now up and running, and the next step we will do is to configure those servers by creating a trusted storage pool and creating the distributed glusterfs volume. From the 'gfs01' server, we need to add the 'gfs02' server to the glusterfs storage pool. Now we will see the result 'peer probe: success', and we've added the 'gfs02' server to the storage trusted pool. Check the storage pool status and list using commands below. And you will see the 'gfs02' server is connected to the peer cluster, and it's on the pool list. For the server production, it's recommended to create the glusterfs volume using the different partition, not using a system directory. Create a new directory '/glusterfs/distributed' on each bot 'gfs01' and 'gfs02' servers. 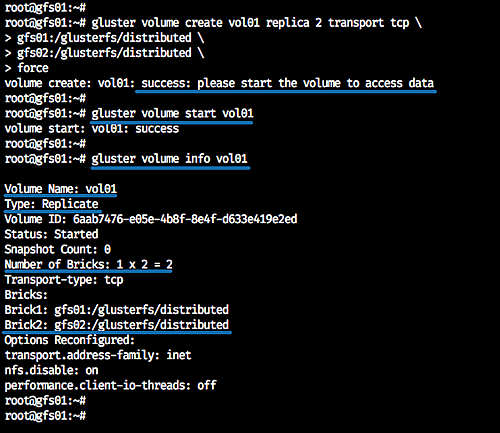 And from the 'gfs01' server, create the distributed glusterfs volume named 'vol01' with 2 replicas 'gfs01' and 'gfs02'. Now we've created the distributed volume 'vol01' - start the 'vol01' and check the volume info. At this stage, we created the 'vol01' volume with the type 'Replicate' and 2 bricks on 'gfs01' and 'gfs02' server. All data will be distributed automatically to each replica server, and we're ready to mount the volume. Below the 'vol01' volume info from the 'gfs02' server. In this step, we will mount the glusterfs volume 'vol01' to the Ubuntu client, and we need to install the glusterfs-client to the client server. Install glusterfs-client to the Ubuntu system using the apt command. 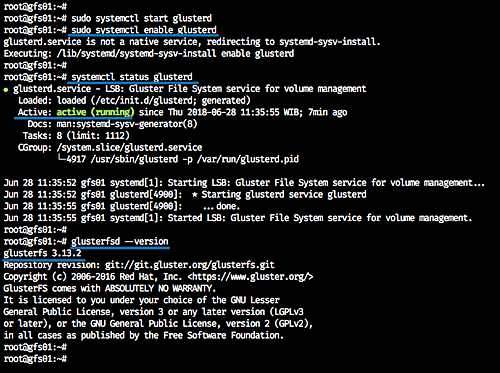 Now create a new directory '/mnt/glusterfs' when the glusterfs-client installation is complete. 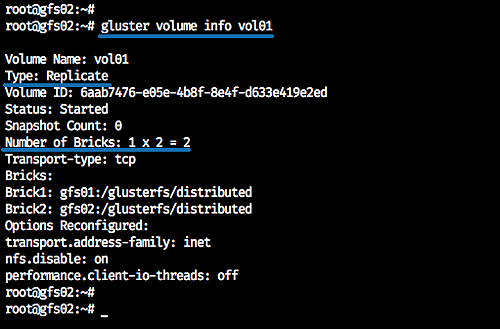 And mount the distributed glusterfs volume 'vol01' to the '/mnt/glusterfs' directory. Now check the available volume on the system. And we will get the glusterfs volume mounted to the '/mnt/glusterfs' directory. To mount glusterfs permanently to the Ubuntu client system, we can add the volume to the '/etc/fstab'. Edit the '/etc/fstab' configuration file. Now reboot the server and when it's online, we will get the glusterfs volume 'vol01' mounted automatically through the fstab. In this step, we will test the data mirroring on each server nodes. Mount the glusterfs volume 'vol01' to each glusterfs servers. Now back to the Ubuntu client and go to the '/mnt/glusterfs' directory. Create some files using touch command. Now check on each - 'gfs01' and 'gfs02' - server, and we will get all the files that we've created from the client machine. Here's the result from the 'gfs01' server. And here's the result from the 'gfs02' server. All files that we created from the client machine will be distributed to all the glusterfs volume node servers. hi, many thanks for article. It's very elucidated. I'd like to know about the performance. In case I have more servers working as bricks, with this configuration you taught us with time nd more archives the performance can be affected. Can all of this became slower? And the type of the volume, in this case, replicate. Are there any others? is completely unnecessary. The Ubuntu .debs in the gluster PPA are signed by Launchpad with their key. Follow the Launchpad instructions for installing their key. You only need the key from download.gluster.org to install the Debian (jessie, stretch, buster) .debs from the apt repos on download.gluster.org. Follow the instruction from the official documentation. [2018-09-21 21:04:38.151104] I [fuse-bridge.c:5260:fini] 0-fuse: Unmounting '/mnt/glusterfs'. But how about your opinion if using GlusterFS as Datastorage to store big data? And can we create RAID with hard disk use in 2 server?